In this blog post, I will cover section 1 objective 1.2 of the VCAP6-NV Deploy exam. The NSX vSwitch is based on the vSphere distributed switch, which provides uplinks for the ESXi host connectivity to physical switches. 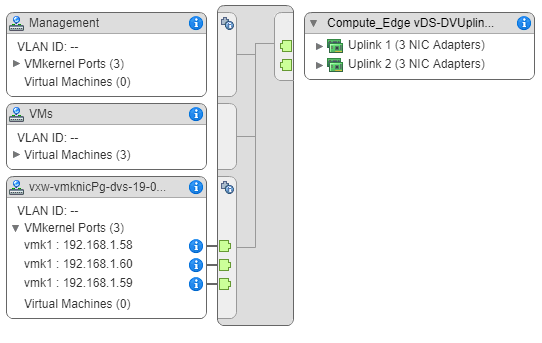 Although you may connect a host to mulitple VDSs, for simplicity, I create a VDS for each of my clusters. In my lab, I have two VDSs. One is for my management cluster and the other is for my edge and compute clusters. The main thing that you want to make sure of when it comes to a NSX vSwitch is that you change the MTU size to 1600. The reason behind this is the added header size that the VXLAN encapsulation adds to a packet. 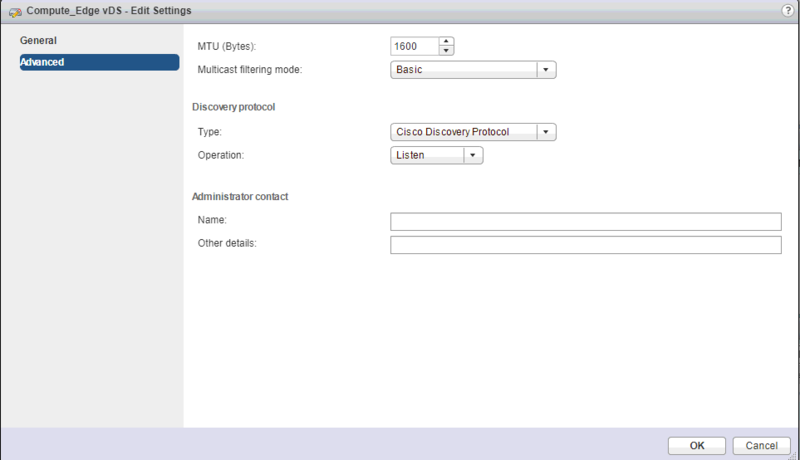 To change the MTU on your VDS, right click the VDS and click Edit Settings. Under Advanced, you will see the MTU size. Change that to at least 1600. If your Installation Status shows Not Ready, you may need to reboot your hosts in order for everything to finish setting up. In my case, I’ve already rebooted and now I’m just waiting for it to finish. Do this for all clusters that you want prepared for NSX. I don’t think I could explain this any better than pg. 113-117 of the NSX Reference Design Guide so I won’t try to reinvent the wheel here. Do not mix teaming policies for different portgroups on a vSphere Distributed Switch. If uplinks are shared in these different teaming policies, then traffic will be interrupted. If logical routers are present, there will be routing problems. As a best practice – if you want to use IP hash based teaming (Ether channel, LACPv1, or LACPv2), use all uplinks on the vSphere Distributed Switch for the team and do not have portgroups on that vSphere Distributed Switch with different teaming policies. Navigate to Networking & Security > Installation > Host Preparation. 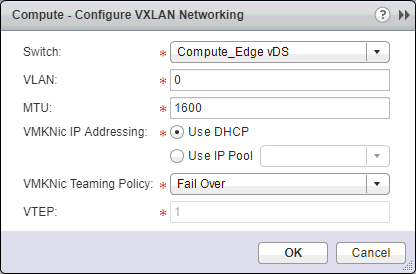 Click Not Configured under VXLAN. This is where we will decide the VTEP teaming method and IP addresses that the VTEPs will use. For my lab, I’m going to use Fail Over for the teaming method. 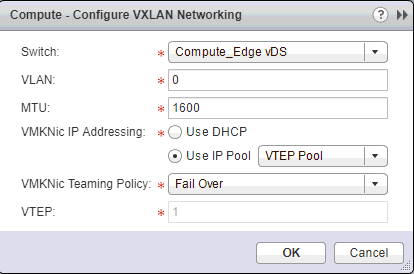 Select the newly created IP Pool and click OK.
Also if we go look at our vDS, we will see that another VMkernel portgroup was created. This what the VTEPs connect to. Navigate back over to Networking & Security > Installation > Logical Network Preparation > Segment ID. This is where we will create the VXLAN Network Identifiers (VNI). These are the numbers that are assigned to logical switches as they are deployed. 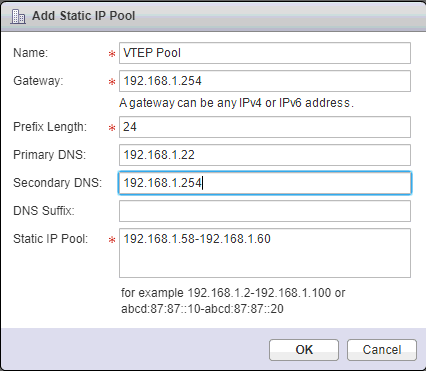 You must specify a segment ID pool for each NSX manager to isolate your traffic. The range starts at 5000 and ends at 16777216. 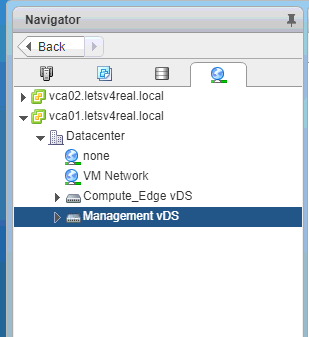 Make sure your segment IDs do not overlap any other NSX install that you might have. Also, you should not create more than 10,000 VNIs in a singe vCenter because vCenter limits the number of portgroups on a vDS to 10,000.